I want to be able to connect to my home network from anywhere. There are two ways to do this, the first is to open up ports on my firewall, and route them through to the various programs that I want to be able to access from the outside world. This approach has implications, firstly it means that anyone could attempt to connect to those services that I want to access. This means that someone could hack into my network. This isn’t a nice thought. A vpn allows me to encrypt the data sent from my devices. So this means that I can use other peoples networks without having to think about people that could want to snoop. Lastly, using a VPN I could connect to my home network from anywhere in the world, then using my VPN I could use internet services as though I’m at home – this is because any data seen on the internet would be seen to be coming from my home network. So, if there is something that I can access from only my home IP Address, I can still access it even though I’m somewhere else. This makes a great security feature as I can have hosted services a website and have the admin access locked down to only my home IP address. Of course if my home IP address changes there could be a problem but that’s not something that happens often, so it’s better than leaving it open to the whole world to try and access. 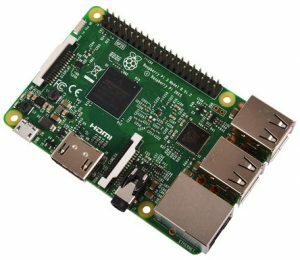 Why a Raspberry PI 3? The Raspberry Pi 3 is the latest version of this great little device. It’s small, and doesn’t need a fan, so it’s silent. The tech specs are looking good as well. It’s got a 1.2Ghz Quad Core processor. Pulls less than 1A power, although they recommend a 2.5Amp power supply for this version. The device boots up fast, and the Pi uses a Micro SD card as a hard drive. It runs the Linux operating system which is free, and has been used in servers worldwide for years. Overall this is a fantastic piece of hardware. The network power is only 10/100 Mbps, which with today’s fast internet could be a problem, however having a vpn server that is capable of delivering 50Mpbs (1/2 the 100Mbps) is more than enough for most applications, if you need more throughput maybe should should be thinking about a more expensive solution to the problem. For my needs, to be able to securely access my home network, copy files. 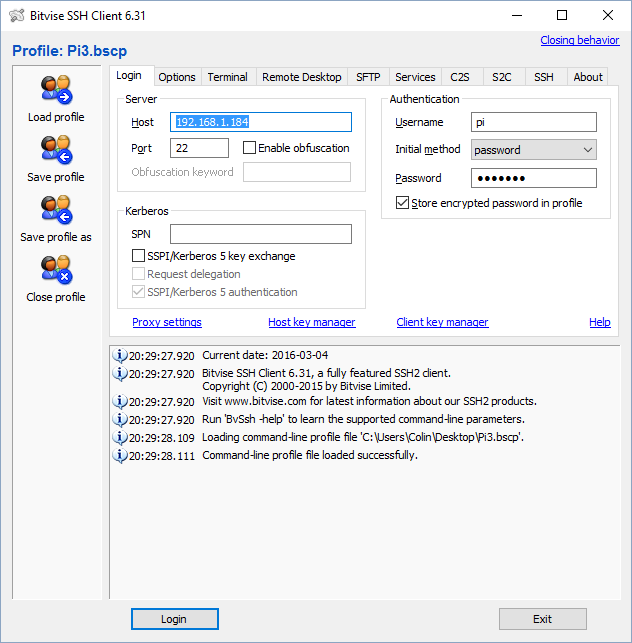 Make remote desktop connections and access me home network devices, this device suits my needs. Yep, it’s a complicated thing to setup and use, however that the purpose of this post. To make it relatively straight forward. There will be lots of steps to follow and it’ll take a few hours. This has be posted about before, actually I’m using a post on this very topic from the BBC as the basis of my post. Only since they did it things have been altered a bit which has caused the source post to be incorrect now. Let’s start this post from the very beginning. First step is to download Rasbian Jessie from here. I downloaded the full version as pictured here. 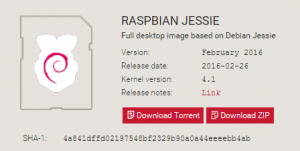 Choose Download Zip to get the zip file version, next extract the zip file and you’ll get a single file 2016-02-26-raspbian-jessie.img. Keep this for a in a little while. The next thing that you need to get is a program called Win32 Disk Imager. You can download it from here. Once downloaded run the setup program. Once completed launch Win32DiskImager. Put the Micro SD card that you are going to use for the Pi, into a memory card reader and insert that into your computer. 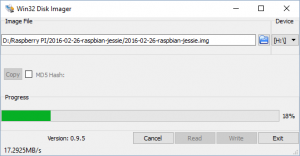 Using the Win32 Disk imager, click the blue folder icon and use the dialog to find and select the 2016-02-26-raspbian-jessie.img that you extracted from the zip file earlier. Make sure that the Device box shows the drive letter for your Micro SD card. When you are ready, press the Write button. This will erase any data on that drive, so make sure that you choose the correct drive. This will take a few minutes to complete. Once done, eject the Micro SD from your computer and plug it into the Rasberry Pi 3. Connect up the Pi and power up. 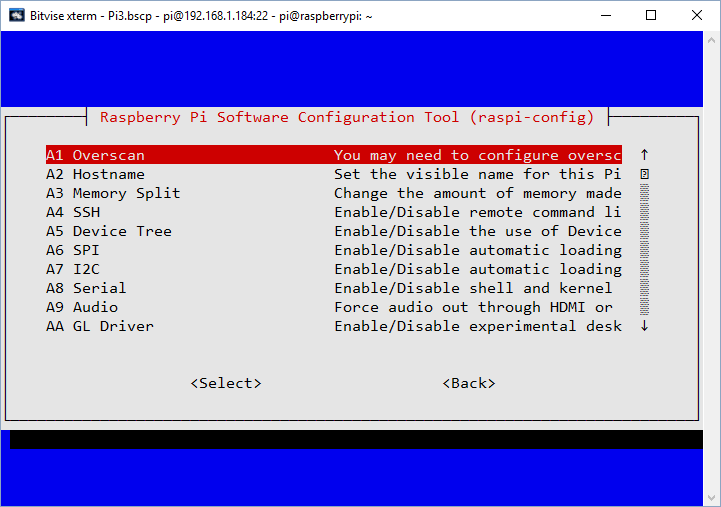 Make sure to have both a mouse and keyboard installed on the Pi as it will now boot directly into the GUI rather than the command line. The fourth item down is Boot, change this to CLI. (It means command line interface) and choose OK. I want to get us to the command line as quickly as possible. This will make it easier for me to include screen shots. look through the text that came up and let’s find that IP Address. when you are looking for is the block that starts “eth0” the second line of that block will have an piece of text that reads inet addr: followed by a four part number, something like 192.168.0.47. This screenshot shows the result of my ifconfig. In my case the ipaddress that I’m after is 192.168.1.184. Armed with this piece of information, we’ll get a program called and SSH Client up and running, this program will let your access the command line of your Pi from your computer. The SSH Client that I’m using is called bitvise you can download it from here. Install it and when you start up you’ll get a screen that looks like this. You’ll notice that I’ve type the IP Address of 192.168.1.184 into the Host box. 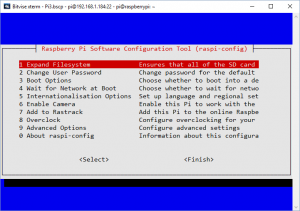 In the Authentication enter pi as the username and “raspberry” as the password. Then click login. If you have done it right, you’ll get the console window appear on your screen. At this point you can unplug the monitor, keyboard and mouse. From this point on we can do everything through the console window. Doing this will make things extremely easy, as you can even copy/paste the command from this post straight into the console window which will reduce the chance of spelling mistakes. 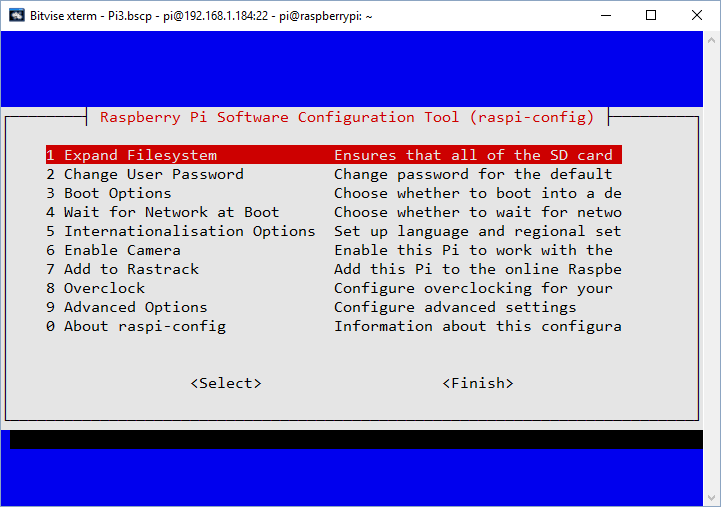 So apart from turning off the GUI desktop, we still have our Raspberry PI in the factory configuration, this isn’t good for a VPN server, so let’s sort that out right now and I’ll talk you through the changes and why. 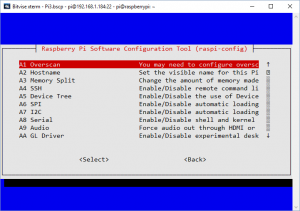 sudo is a command that means “Please run the next command in god mode”, sudo litererally means “superuser do”, raspi-config is a program that will let you configure the Rasberry Pi. 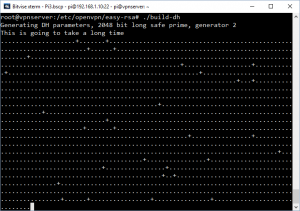 This is the console version of the program that you ran on the desktop to get to the command line. For those that have never run a console application before, the red line is the selected item. Press enter and you’ll run the Expand Filesystem command, you can do that now, so that your Mirco SD card will fully available from the next reboot. (We’ll reboot later), press enter after the expansion has finished and you’ll come back to the menu. Use the up and down arrow keys to navigate. Choose “A2 Hostname”. You’ll get some instructions about what is allowed. I’m choosing this so that I can name my Raspberry Pi as “vpnserver”. This is the name that it will appear as on my network. If you don’t do this, your will be called “raspberrypi”. You can choose any name that you wish, just be aware that only one device on your network can have that hostname. You’ll notice that you were taken back to the first menu, so go back into the advanced menu and choose “A3 Memory split” by default the PI assigns 64MB of it’s 1024MG Ram to the graphics processor. So a value of 0 really means use 64MB. In future they may increase this further so to allow that the config value is set to 0, with really means “do what you like”, and is translated on boot to 64MB. This is done so that the nice looking GUI that you saw on first boot can work, look nice, perform well and play games. This is great for a media center, or a games machine, but for a VPN server we don’t need that. and we’ll have more RAM available for the CPU and keeping the PI running for a long time. 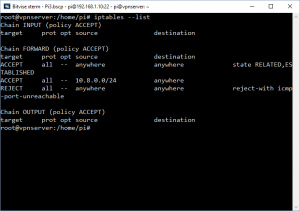 By default your raspberry PI is configured ask for an IP address from a DHCP server. Most home networks have a router that provides this service. For a VPN server, we need to make sure that the IP Address remains the same, so rather than using a DHCP server, we will tell the PI what IP Address to use. 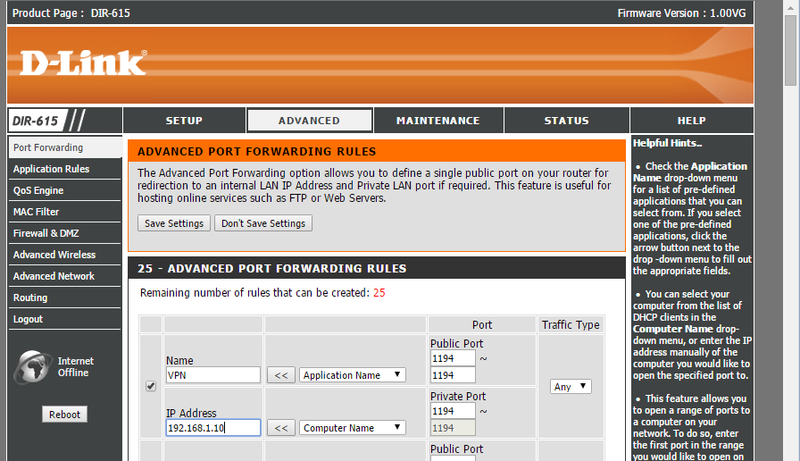 # Custom static IP address for eth0. The code about eth0 means the wired network port. 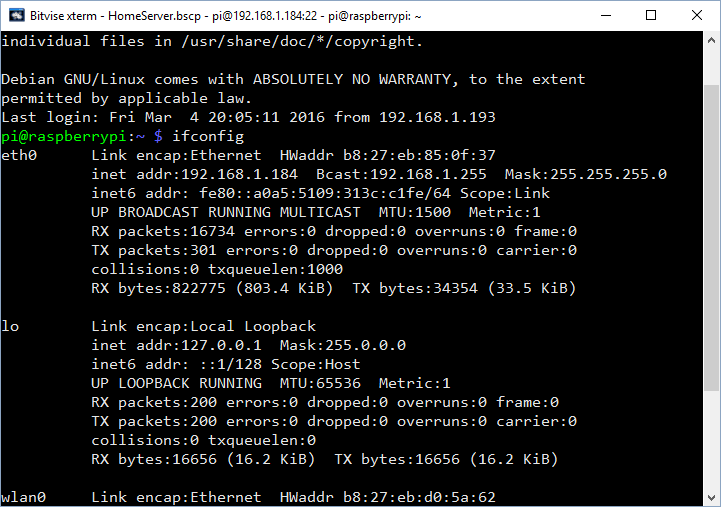 192.168.1.10 is the new static IP Address for the Raspberry Pi 3. you can change this number if you want a different IP Address. Router is the IP address of your router, It’s normally 192.168.1.1, and your router also has a domain name server as well, so again should be the same. If your network is different feel free to switch out the information. Now press and hold Ctrl and press the X key (This is normally written as Ctrl-X) then press Y to save the changes. Next press enter, and you’ll be returned to the command prompt. If you’ve followed everything correctly you should now be able to open a new console window on the new IP Address. So what happened to the VPN Server? These two command make sure that you are running the very latest version of Rasbian Jessie and that any software patches are applied. A bit like windows update. Next let’s get the VPN software installed. We’ll need two commands. OpenVPN is the name of the VPN Software. This is the equivilant of running an installer in windows, but it also downloads the program from the internet as it does it. 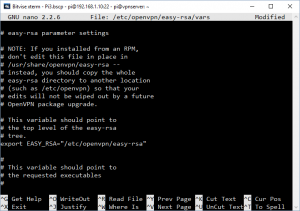 easy-rsa is going to help us configure OpenVPN. Time to become a deity, at least in linux terms. Up to now you have been typing sudo in front of every command, this is ok, but it’ll get very tiresome very quickly, especially with what I we will be doing, so enter this. Once you entered the command notice how the command prompt changes. This lets you know that you are now running in super user mode, you are now running as “root” instead of “pi”. Root is the linux way of saying that you are all powerful. 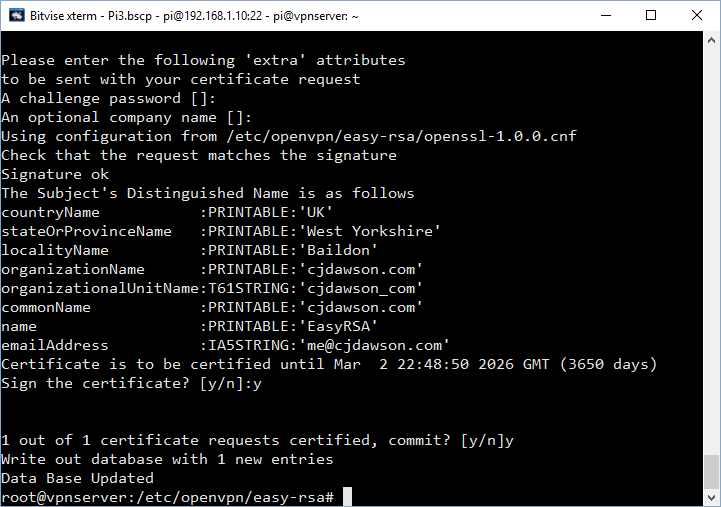 This copies the content of the /usr/share/easy-rsa folder to /etc/openvpn/easy-rsa. 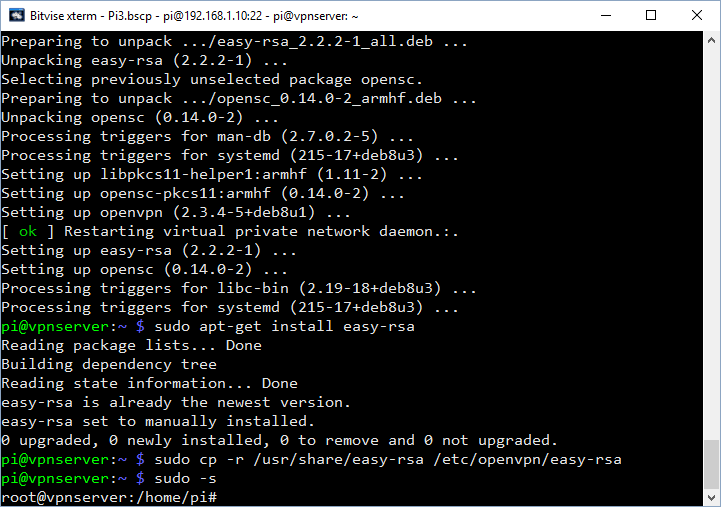 The second folder is where the OpenVPN software will be getting the configuration information from. So this saves us from setting everything up manually. cd means change directory, and we are switching into the directory where we copied the easy-rsa files earlier. see the image on the left to see what how it needs to look. Next move your cursor down until you see the line. This next step is optional, I skipped this as I want more security, it’s here in case you want to do it. If you want to speed up the install, but at the cost of security, change this number to 1024. Doing this will mean that you can save yourself an about an hour of install time, but at the cost of your VPN being less secure. I personally chose to keep this at 2048 as once that step that takes an hour as done you will have a more secure connection. Keep scrolling to the end of the file and you will see a bunch of export parameters such as Country, Province and City etc. You can choose to change these to set new defaults (this will potentially save you some typing in various later stages), but doing so will not affect the workings of your VPN. Save the file and exit from Nano. Press Ctrl+X then Y and enter. With Raspbian Stretch things changed a little so here’s a new command. 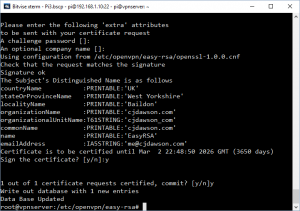 These commands will build the certificates that will be used with authenticating. The Pi will now ask you to complete some additional values, like Country, Province, City, Organisation etc. (if you changed these in the previous stage you will see your own choices already set as default). Hopefully you set them earlier, so you should be able to simply press enter for each of these to use the value that is in the brackets. Common Name MUST be the server name you picked. A challenge password? MUST be left blank. Your server is now set up and you need to build keys for all the devices you want to be able to connect. You can cut corners here and just build one key to use on all devices. Only one device can connect using each key at a time though, so if you want simultaneous connections you will need a different key for each one. As I have an iPhone, iPad, Android Tablet, MacBook Pro, Windows laptop amongst other kit I will be making a seperate key for each device, plus I’ll be making keys so that I can access from work, and one so for general purpose use. This way, I can connect several devices at the same time, also if one of the keys is left somewhere, it will be easy enough to change the lock without having to reset everything. Don’t forget to replace [UserName] with the name that you want for your key. … choose a password you will remember! It asks you to input this twice to eliminate errors. You will then be asked to enter and repeat a new PEM pass phrase for the des3 key. I used the same pass phrase for both so you only have one to remember. You will need the 3des.key pass phrase at the end of this process when you import your files to your devices. Repeat these steps for all the usernames you want to build a key for. Generate the Diffie-Hellman key exchange. The screen will slowly fill with dots as the key is built from random numbers. This should take just over an hour, unless you did the step to lower the 2048 number to 1024 earlier in which case, it’ll take about 5 minutes. If you are using copy and paste it probably will not work on this line as the double “-” seems not to translate in the same way if you do not type it in. 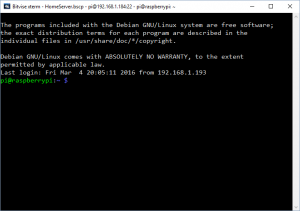 Now you have created all the locks and keys you need to tell your Raspberry Pi where you want to put the doors and who you want to give the keys to – essentially instructing the OpenVPN which keys to use, where you are going to be connecting from and which IP address and port to use. This opens an empty file. hit Ctrl+X then y and enter to save. 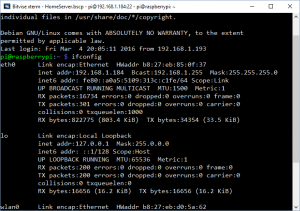 There is one last edit to make in the server configuration files to make sure your Raspberry Pi knows you want it to forward Internet traffic through our new network. 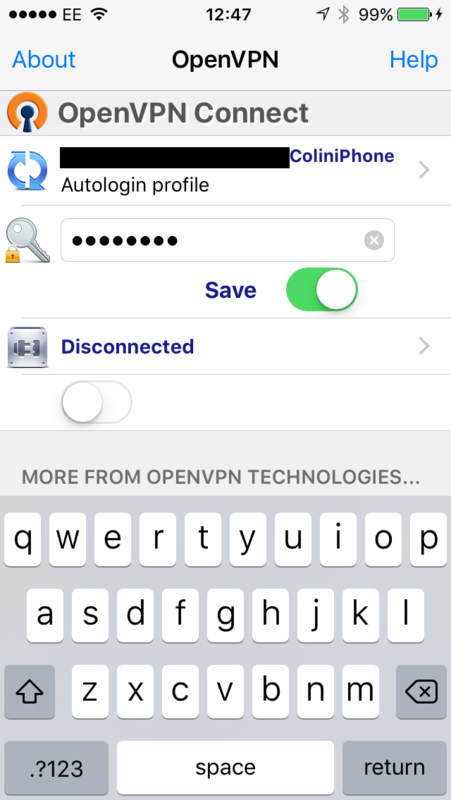 You want to remove the “#” from the start of the next line to inform OpenVPN you want it to take that text into consideration. Hit CTRL-X, then Y and ENTER to save. You have now made a functioning server that can access the internet. We have created keys for clients (computers and devices) to use to connect to your VPN, but we have not told the clients where to find the server, how to connect, or which key to use. If you created several different client keys for each of the devices you want to grant access, it would be a lot of trouble to generate a new configuration file for each client from scratch. Luckily Eric Jodoin of the SANS institute has written a script to generate them automatically. In the above I replaced [YOUR PUBLIC IP ADDRESS] with the domain name of my Dynamic DNS which is a feature of my dLink router. echo "Please enter an existing Client Name:"
echo "[ERROR]: Client Public Key Certificate not found: $NAME$CRT"
echo "Client's cert found: $NAME$CR"
echo "[ERROR]: Client 3des Private Key not found: $NAME$KEY"
echo "Client's Private Key found: $NAME$KEY"
echo "[ERROR]: CA Public Key not found: $CA"
echo "CA public Key found: $CA"
echo "[ERROR]: tls-auth Key not found: $TA"
echo "tls-auth Private Key found: $TA"
echo "Done! $NAME$FILEEXT Successfully Created." CTRL and X then Y and ENTER to save. N.B. I was not able to successfully copy and paste the entire script accurately in one go, but taking it one section at a time worked no problem). Repeat this step for each additional username you added client. into the address bar, the press enter. Click on the type column to sort the files listed by type. 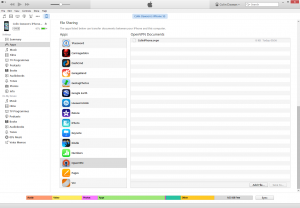 Scroll down to find the files ending in .ovpn, they'll be grouped together. Select them and drag them to the window on the left. This will copy the profiles from the Raspberry Pi to your computer. now back in the Raspberry Pi console type. If you attempted to connect to your VPN you would be able to do it however it won’t be able to do anything, so we need to override the firewall that’s already build into the ip. Here is the content of the script. 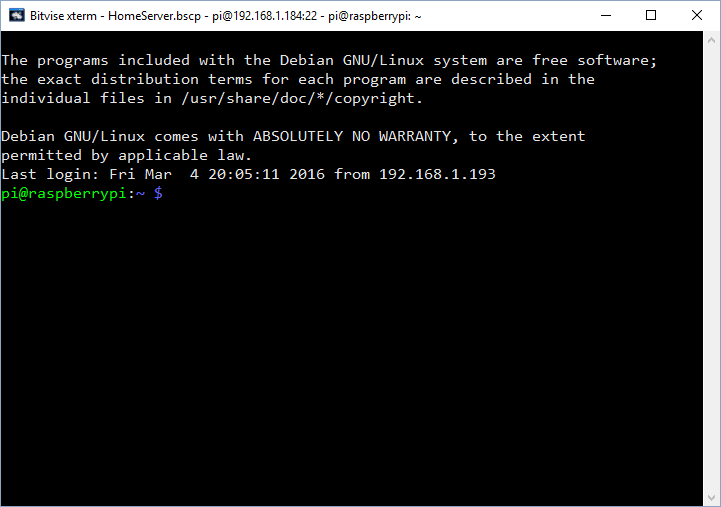 We can run it now, so that you don’t have to reboot your Pi. And to see that it’s worked, execute this command. What this means is that all traffic from ip address 10.8.0.0 (the unencrypted end of your vpn) can send network packets anywhere. Any device connected to your VPN will communicate with OpenVPN using encrypted data. 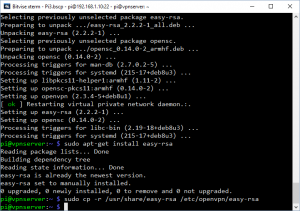 OpenVPN then unencrypts that data and sends the packet on from ip address 10.8.0.0. This is a technology called Network Address Translation (or nat for short) and is how your router connects to the internet. We’re using the same thing to make the VPN possible. Now, let’s make that firewall stuff survive a reboot. See the image on the left to see how the edited file should look. Now Ctrl-X then Y and enter. Here’s a screenshot of the settings that I have done on my D-Link router. Save that change, and you should be done with all the configuration. Now let’s get it working. 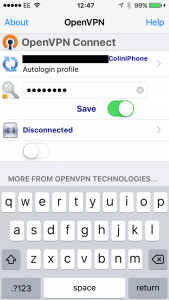 To connect to your VPN you are going to need to setup the OpenVPN client application on your device. As I have a several Apple devices, I can show you how to do it on those, for android the process should be extremely similar. This is where you will be using those ovpn files that we copied off your PI earlier. They are the keys that let your devices access the VPN. 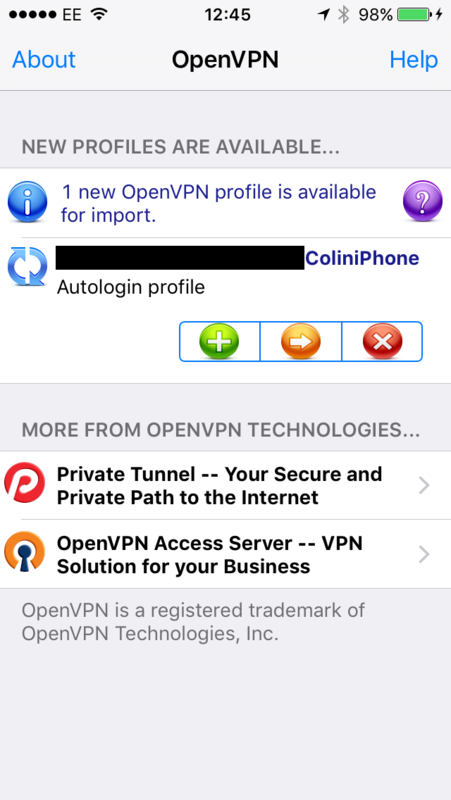 To setup and iPhone or iPad, you’ll first need to install the OpenVPN connect, which you can get for free from the Apple App Store. Once that’s installed, you need to connect your iPhone or iPad to a computer. I’m sure there are other ways, but this is the most secure method that I know of. In iTunes select your iPhone/iPad then click on Apps in the left menu bar scroll the window down and you will see a file sharing section. 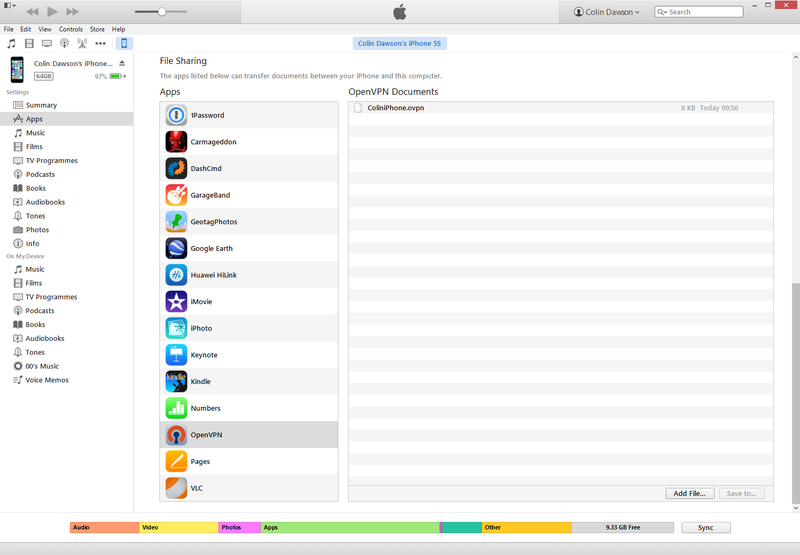 Inside that file sharing section fine the OpenVPN program and click on it. To the right you will see a big panel that says OpenVPN Documents. Click on that and then click the “Add file…” button in the bottom right of the screen. Use this to find your ovpn file and click open. The screenshot below should help if you are struggling to follow that. Now let’s head over to the iPhone itself. 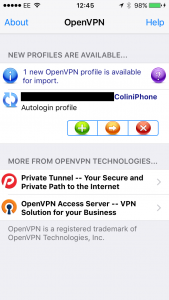 Open the OpenVPN app. 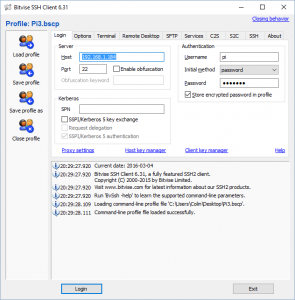 You will see the profile that you setup earlier when we were making the ovpn files. This means that you don’t need to type in your ipaddress or anything like that. The ovpn file already knows where to connect. Press the Green + to import the profile. Next type in your private key password. This is the PEM password that you entered earlier. Now the moment of truth. Below the word disconnected is a slider, this is how you connect to your VPN. slide that to the right, and if it works you’ll see a screen similar to below. At this point you can now switch to your web browser, and see if you can browse the internet. If you can, everything is working just right. Your iPhone/iPad will now encrypt all your internet traffic and send it to your vpn server. Thanks for the guide. So far so good but I was having issues with the firewall.sh part. Sorry – I accidentally clicked port comment. Any thing im doing wrong? Glad to see that you got it working. I’ve updated the post with the correction (removed the ” marks from the IPAddresses) not sure why I didn’t have problems with it as I was copy/pasting when I made my VPN server. Great guide ! Thanks for it. 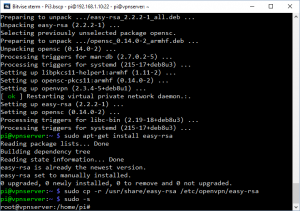 I had a lot of trouble installing openvpn on a raspberry pi 2 before finding it. – Also the quotes (“) did not copy well. I would suggest to give all the commands/scripts as unformated text files or in “code” blocks to avoid this kind of things, maybe it will help. Nice Guide, I’ve noticed my Public IP is the same whether I am connected to Openvpn or not. Did I miss a step or is there something I can do to mask this? with my vpn off, I got the real public ip of my ipad (using only the 4g connection). Next I turned on connected to my Open VPN using, and refreshed the google link. The IP Address then changed to my home network. 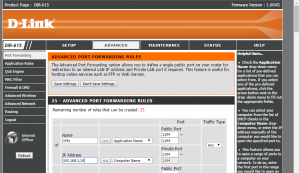 Finally, disconnecting the VPN and my public IP reset to normal. In my case it’s working great. I do remember when I set up the VPN and was building the blog post, there was a setting that you could adjust on the server side that decided whether your device made all IP traffic via the VPN, or used the VPN as a service (I forget it’s official name). On the first configuration (and I’m sure this is what I blogged) all IP access is routed through the VPN, making it appear as if your computer is part of the network where the VPN Server is located, regardless of where you really are. The other mode, allowed you to access the devices on the VPN, but it didn’t route your network traffic through the VPN. This other mode is so that you can gain access to the network, but without masking where you are. This second mode is what I would expect a company to set up for their employee’s who connect in from home. It means that their internet browsing doesn’t go through the vpn, but stuff that’s directed to the company resources would go through it. I’m guessing that you’ve probably configured this setup for your server. If I remember it correctly, the difference is something in the /openvpn/server.conf and in the .ovpn file that you use to connect. I can’t remember the details, but know it’s something to do with the PUSH commands. Got it working on a Pi2. Great guide. 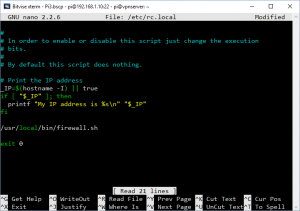 Just wondering if there is an easy way I could toggle the server on and off from a python or shell script? What command could I used to turn the server off without rebooting? I just want an easy way to enable/disable it without messing with the router settings. Sounds like all you need to do is start or stop the Open VPN service. Can’t remember the command to do this offhand. I leave mine turned on all the time. It’s working like a charm. What exposure length do I need?